What’s in a name? A ton of historical information, especially if all you have is a place name. 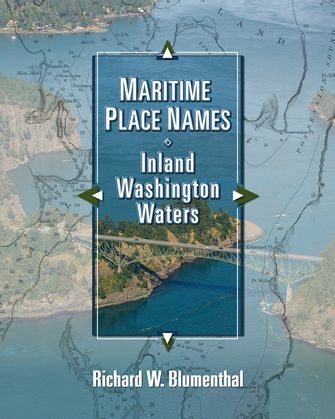 That’s what Bellevue, Wash., researcher and author Richard W. Blumenthal discovered and documented in his new reference book, Maritime Place Names: Inland Washington Waters, which covers the waters of Puget Sound, the San Juan Islands, the Straits of Juan de Fuca, and the Pacific Coast of Washington. Blumenthal’s company, Inland Waters Publishing, has just announced the book’s availability. The book is heavily illustrated with 100 aerial photographs, 40 panaromic sketches by artist George Davidson, and 30 historical charts beginning with the early voyages of the Spanish and continuing with those of George Vancouver, Charles Wilkes, and later explorers. The charts go back to the 1780s. “Their precision is amazing when you realize the only instruments used, at least early on, were a compass, a sextant and a lead line,” Blumenthal says. The 348-page, large format book is available directly through the author for $29.95 plus tax and shipping. For ordering details, email RichardWBlumenthal@hotmail.com or visit http://inlandwaterspublishing.com/.